When your summer guests are gone for the season, and your family changes gears for their fall schedules, you’ll have less chaos and more focus for cleaning your quiet and empty house. Not only the well-used spaces in your home, but the ones that didn’t get much use while you were on your porch, the patio and in your yard. 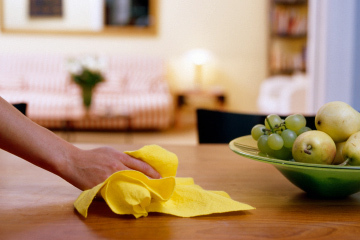 Well used areas like the kitchen, bathroom and entryway need a solid deep cleaning. It’s lovely to spend time outside, but there’s lots of dirt, allergens and bacteria that can find their way inside and flourish with the help of heat and humidity. Neglected indoor spaces like the living room, dining room and finished basement have had time to collect dust and stale air if those doors and windows have been closed. There’s been plenty of dirt and germs brought in, but they also need a way to get out. And whether your windows and doors have been closed or opened, pollen finds its way on to everything. – First, put away all summer equipment that has gathered around your house – beach towels, sunscreen, outdoor yard games, sports equipment, bathing suits, etc. Clean them and store them for next year. – Have your deck, patio and siding power-washed. If you’ve had bonfires, or used a fire pit, soot has worked its way on to outdoor surfaces. – Set up a space near your door so as soon as people enter, make sure there is space to remove and place outdoor gear, shoes, bags and backpacks either in a closet, on hooks or in cubbies. This will keep dirt and debris from traveling further in to your home. Use microfiber rags – They collect and contain more dust, making cleaning more efficient and longer lasting. And don’t forget the bedrooms where moist bathing suits and towels may have gone unnoticed on the floor or bed, and shoes might have been kicked off, bringing in dirt, bugs, grass and anything else that clings to the bottom of summer sneakers and sandals. Give everything a good dusting, and don’t forget the ceiling fans. Move the furniture and vacuum behind and under each piece. Remove your mattress covers and wash them, and turn your mattress. This type of house cleaning is a lot of work and a huge time commitment when your schedule may be full of back to school and work obligations. 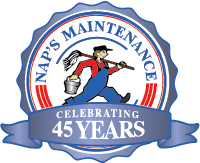 NAP’s Maintenance is here to help with a variety of home cleaning services for the Fall as well as weekly and bi-weekly house cleaning services.